In the year 2010 an international, two-stage architectural competition was held for the design of a new concert hall for more than 1800 seats together with the architectural development of the property at 272 Grochowska Street. From among the 138 submitted entries, the jury of the competition selected the entry submitted by Atelier Thomas Pucher from Graz. 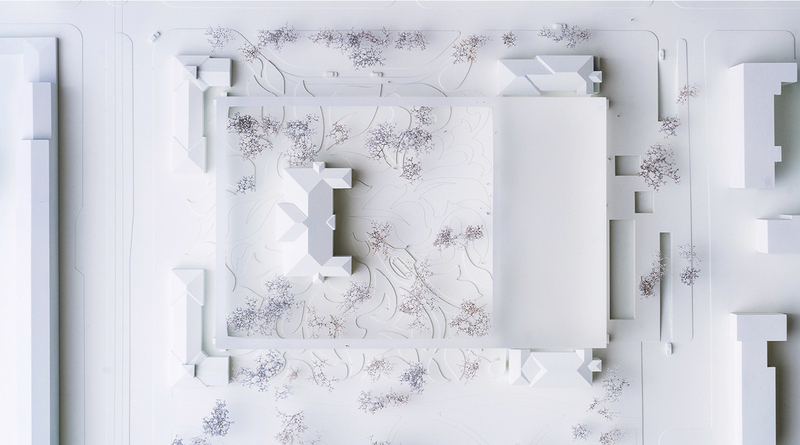 In 2015, in the presence of Hanna Gronkiewicz-Waltz, President of the Capital City of Warsaw, architect Thomas Pucher and Director of the Sinfonia Varsovia Orchestra Janusz Marynowski signed a contract for the development of design documentation. The project timetable provides for the completion of the design work in 2018 and commencement of construction work at the turn of 2018 and 2019. The completion of the 1st stage of the construction work and opening of three buildings facing Grochowska Street will take place in the spring of 2020. Completion of stage two and opening of the concert hall is scheduled to take place two years later – in the spring of 2022. The objective of the project is to create a new cultural centre for the city of Warsaw, centred around the Sinfonia Varsovia Orchestra. The centre is intended not only to be an attractive location for the presentation of classical music and other arts, but also a place to spend free time. The fundamental premises of the project also entail the renovation and adaptation of 5 historical buildings of the former Veterinary Institute for the performance of new functions, the construction of the largest concert hall in Poland (1850 seats, comprising a creative integration of shoebox and vineyard designs) together with the creation of a garden and its connection with the park adjacent to the centre. A spectacular “suspended” lattice frame suspended 3 metres above the ground with stairs hidden inside, leading to a terrace at its top forms an integral part of the design. In the year 2010 an international, two-stage architectural competition was held for the design of a new concert hall for more than 1800 seats together with the architectural development of the property at 272 Grochowska Street. From among the 138 submitted entries, the jury of the competition selected the entry submitted by Atelier Thomas Pucher from Graz. In 2015, in the presence of Hanna Gronkiewicz-Waltz, President of the Capital City of Warsaw, architect Thomas Pucher and Director of the Sinfonia Varsovia Orchestra Janusz Marynowski signed a contract for the development of design documentation. The project timetable provides for the completion of the design work in February 2020 and commencement of construction work in October 2020. The completion of the 1st stage of the construction work and opening of three buildings facing Grochowska Street will take place in the autumn of 2022. Completion of stage two and opening of the concert hall is scheduled to take place in 2025. The Sinfonia Varsovia Orchestra found its own home only in 2010 – the former Veterinary Institute in the historic Kamionek district of Praga Południe, a major district of Warsaw. The property is outlined by Grochowska and Terespolska streets, and to the east lies the Obwodu Praga Armii Krajowej Park. The history of Kamionek, formerly referred to as the hamlet of Kamion harks back to the Middle Ages. It became a part of Warsaw only in 1889. The complex of the former Veterinary Institute was built in 1899-1900 in accordance with an historicizing, neo-renaissance design by Vladimir Pokrovsky. Five of the oldest buildings are on the historical heritage register. In the centre of the complex lies the largest, most imposing building. Immediately beyond it, to the north-east, lies the park. The corners of the complex are occupied by single-story pavilions (facing Grochowska Street). There are also two two-story Annexes towards the back of the area. This palace-like layout with a clearly delineated axis is one of its fundamental merits and a major reason for placement on the historical heritage register. The remaining buildings were erected after 1925. They are currently used as office and technical facilities. Sinfonia Varsovia is a leading Polish symphony orchestra and an ambassador of Polish culture around the world. It was established in 1984 based on the Polish Chamber Orchestra. It has played under the direction of such famous conductors as Yehudi Menuhin, Krzysztof Penderecki and Marc Minkowski, accompanying equally renowned soloists, includin Martha Argerich, Maria João Pires, Nigel Kennedy and Mstislav Rostropovich. The Artistic Director of the orchestra is Poland’s greatest composer Krzysztof Penderecki. In 2008 Sinfonia Varsovia became an institution of culture of the Capital City of Warsaw. The Orchestra’s scope of operations also entails artistic, educational and music appreciation activities in the widest sense of the term. For years, the orchestra was deprived of its own home. Rehearsals took place in, among others, the Railway Vocational School and in the Stanisław Ignacy Witkiewicz “Studio” Centre for the Arts in Warsaw. It found its home in Warsaw’s Kamionek district only in 2010. With the launching of the project, the Sinfonia Varsovia Orchestra began a process of internal transformation. It is our dream for the institution to become one with its new home, to draw energy from the wonderful space and advanced infrastructure and its own artistic tradition.